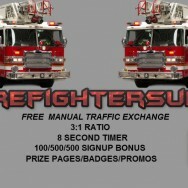 There is a 3-way promo today with Treasure Hunting Traffic, Fire Fighter Surf, and Songman Hits. This is a Promo Slice promo, so if you are not a member, click the banner below. To qualify for the prize drawing all you have to do is surf 125 sites at all three traffic exchanges. Watch for the claim page every 125 sites and enter your Promo Slice username. The claim page shows every 125 clicks, so the more you surf the better your chances of winning a prize.